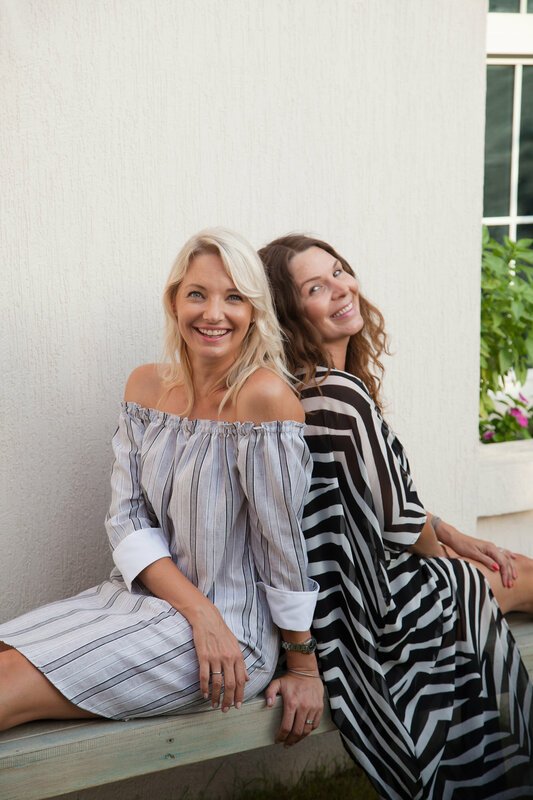 Terhi Pinnington and Hanne Ripsaluoma are the two Finnish mums who conceptualised and are the faces of Omasi, a homegrown brand that is gaining popularity for its practicality for mums and their kiddies in a city like Dubai, where the pool and the beach are such large parts of our lives. 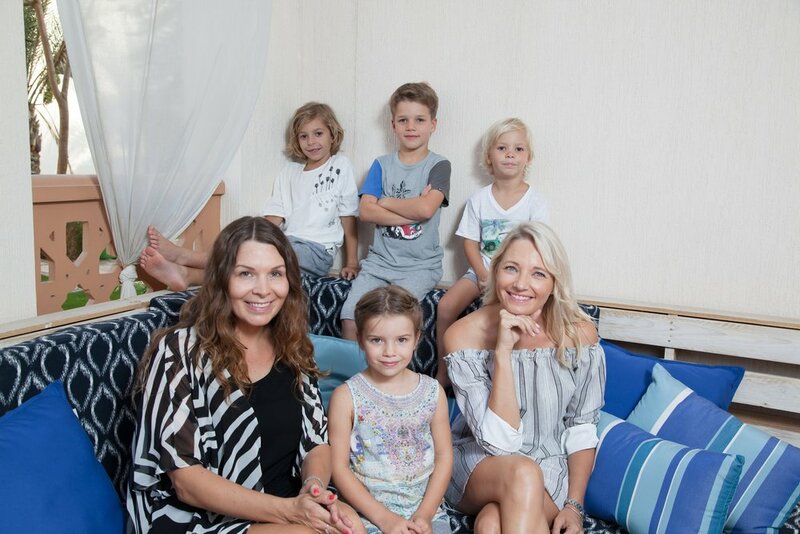 Coming from quite different professional backgrounds, they met through the very active Finnish School in Dubai where their kids were going once a week. Hanne had met her Chilean husband in London and they moved together to Washington DC where she did Business Development for a telecom firm. They then came together to Dubai where she became mum to Roque Antton, who is turning 8 in the summer, and Matteo who is 4. Terhi was living in Barcelona before moving to Dubai 14 years ago to work for Emirates. It is in Dubai where she met her husband, and following her job with Emirates she worked as office manager in a large multinational company until motherhood took the spotlight. Her son Oskar is now 7 and beautiful Evie will be turning 6 soon. Not really having a friendship history, during their chats at the Finnish School they realised they both had a yearning for creating their own clothing and accessories brand that would allow mums and their children to look stylish whilst being comfortable too. So it all started pretty quickly and just flowed from there, learning as they went along. Omasi has just celebrated its third anniversary and to mark the occasion, they hosted a poolside event at the hip Vida Hotel Downtown to showcase their newly launched collection. Also currently, Omasi in partnership with ShoeQ, has a pop-up boutique at the Beauty Connection Spa on Sheikh Zayed Road. There are also lots of other fun products on display, like beesket, for a quick natural juice shot while you browse through the gorgeousness of Omasi and ShoeQ. Hurry and do pop in to stock up on resort wear before the summer break! Only there until Thursday 11 May! But if you miss this, you can still shop online HERE or visit one of their Dubai-based retailers on HERE. The clothes of Hanne and Terhi's on these photos are all Omasi, as are the children's beach ponchos. Read on to find out more about the brand and the beauty (and the challenges) of running a brand like Omasi. We were encouraged to create Omasi by the calling of entrepreneurship, together with the fact that we recognised a gap in the market for reasonably priced high quality, unique beach products. Omasi is a Finnish word (our native language) and means yours or your own. Many of our products can be personalised with embroidery so you can make them your own. Our inspiration for each collection is drawn from the beach life, outdoors and never ending sunshine. On mum duo-ing: It's great to have a partner to share the milestones and challenges with and we find it important to be able to bounce ideas off each other. In many ways we are very similar, but we both also have our strengths in different areas. One of our funniest entrepreneurial stories is when we once wanted to make a beach blanket that was basically 2 of our red beach towels sewn together, but our tailor didn't understand us and sewed them together lengthwise so it became a super long beach towel that looked like a red carpet! We couldn’t stop laughing and afterwards felt pretty bad for the poor guy! The lessons we have learnt from entrepreneurship is that it requires a lot of hard work and long hours. But if work is going to take time away from being with our families, we would rather be working for ourselves. Entrepreneurs needs a lot of patience as usually nothing happens overnight. Sometimes the timelines from signing the contract to getting the products in the shops can take months. Our biggest challenge was the difficulty to source the best tailors and suppliers that understand our ways and can keep up with the growth of Omasi. It was very frustrating and took us quite a while, but we managed to find the best staff and suppliers that we are now very happy with. Hanne: Time goes so quickly. By the time you think you have figured out something, the child is on the next‘phase’ so I have learned to just go with the flow and trust my instincts... and, especially, appreciate every moment. Terhi: There is so much to learn through motherhood and it has been the most humbling and rewarding experience. Now I understand the meaning of unconditional love and I’ve learned to appreciate life’s little moments. I think that after having children, it is quite easy to lose yourself in the selfless cycle of trying to be the ‘perfect mother’, but it is very important also to make time for your own well-being and not to lose your own sense of purpose. Hanne: This is a challenge. I try to be very productive whilst the boys are at school, and also as an entrepreneur you don't have working hours so I try not to let myself get too carried away with work, and make time for my family too. Terhi: As Hanne said, it will always be a challenge to juggle family and work and I think that every business owner understands how easy it can be to get carried away and work even longer hours than you did in your previous 9 to 5 office job. I try to schedule my days so that the late afternoons and evenings are just for the family and if I need to continue with the work, I will usually do it after putting the kids to bed. We both also like to bring our children to the office and to the tailors occasionally so they can understand our work and see what we are doing when we are not with them. An advantage is that all our children have become friends so they can make a playdate out of it too. Hanne: Has to be my mum. She is a working mum of 3 and now as a grandma has unlimited sources of energy when it comes to children. I aspire to have half of her strength and energy. Terhi: My 91-year-old gorgeous grandmother. She is a true fighter and survivor, who has been through a lot, but never gives up and always keeps her positive and fun outlook on life. Our dream for Omasi is that more and more people will be wearing and using Omasi. The plans are to expand to other countries slowly but surely, and at some stage to look into creating a more permanent Omasi brand experience space. Our current pop-up store has been a great test run for this. Note: The wall art at Hanne's stunning Greek-inspired villa is by Spanish artists Teresa Calderon and Mersuka Dopazo - if you like this style too, there are some pieces available for purchase at Blanc d'Ivoire Dubai. All photography is by Mia Kotokarpi, of MiaK Photography. Mia has developed a passion for photography through motherhood and the urge to create lasting memories. She likes to work with families and children, but also thoroughly enjoys capturing events and creating beautiful images of interiors, as well as corporate and journalistic imagery. Being the multi-talented woman that she is, she is now launching her business as a travel consultant with Travel Counsellors and is available from end of May on mia.kotakorpi@travelcounsellors.ae and +971 55 385 1352.